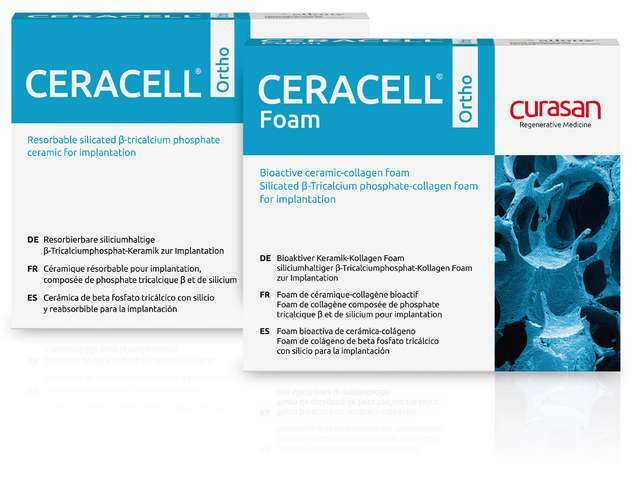 CERACELL ORTHO is silicon-doped β-tricalcium phosphate (β-TCP). This purely synthetic, fully resorbable bioceramic offers excellent material properties. It ensures excellent patient compatibility and ideal conditions for a positive healing process and complete bone regeneration. With its various application forms, CERACELL ORTHO is not only a suitable solution for the many different requirements in spinal surgery, it also offers excellent handling features for surgeons. CERACELL ORTHO is made in Germany. A patented manufacturing process and special production processes in state-of-the-art cleanrooms guarantee high phase purity and consistent quality. Brief, careful kneading of the biological material components until the temporary, required texture has been reached, and direct application of CERACELL ORTHO flexible foam to the implant or defect. The elastic material spreads throughout the implant or defect so there is direct contact with adjacent bone material or the implant material. * The optimum mixing ratio always depends on the consistency of the bone marrow aspirate. Note: Both when using granules and foam, care must be taken to ensure that the biological materials have the correct mixing ratio in relation to one another and are not mixed for too long, so as not to compromise the solidity of the granules and of the foam.